Info Astronomy - Astronomers have partially solved an epic whodunit: What kills galaxies so that they can no longer produce new stars? 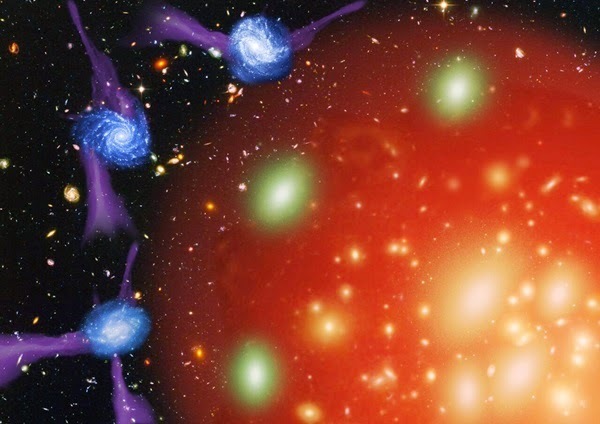 As murder mysteries go, it’s a big one: How do galaxies die and what kills them? A new study has found that the primary cause of galactic death is strangulation, which occurs after galaxies are cut off from the raw materials needed to make new stars. Researchers from the University of Cambridge and the Royal Observatory Edinburgh have found that levels of metals contained in dead galaxies provide key “fingerprints,” making it possible to determine the cause of death. There are two types of galaxies in the universe: roughly half are “alive” galaxies, which produce stars, and the other half are “dead” ones, which don’t. Alive galaxies such as our Milky Way are rich in the cold gas — mostly hydrogen — needed to produce new stars, while dead galaxies have very low supplies. What had been unknown is what’s responsible for killing the dead ones. Astronomers have come up with two main hypotheses for galactic death: Either the cold gas needed to produce new stars is suddenly “sucked” out of the galaxies by internal or external forces, or the supply of incoming cold gas is somehow stopped, slowly strangling the galaxy to death over a prolonged period of time. In the case of death by strangulation, however, the metal content of the galaxy would keep rising and eventually stop, as star formation could continue until the existing cold gas gets completely used up. The researchers were then able to independently test their results by looking at the stellar age difference between star-forming and dead galaxies, independent of metal levels, and found an average age difference of 4 billion years — this is in agreement with the time it would take for a star-forming galaxy to be strangled to death, as inferred from the metallicity analysis.